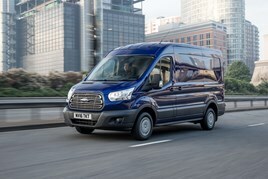 New van registrations fell by 0.2% year-on-year in July to 24,506 units. According to the latest data from the Society of Motor Manufacturers and Traders (SMMT), year-to-date figures show an increase of 2.6% to 216,472 registrations compared with 2015. The UK's new car market was flat in July, with the fleet market propping up demand as private registrations fell by 6.6% year-on-year. Heavier vans saw a small decline in demand, with registrations for the 2.5-3.5-tonne segment down 2.2% last month. However, larger vehicles accounted for 63% of all the vans registered so far this year. Figures for smaller LCVs painted a mixed picture, with registrations of new vans below 2.0 tonnes up 1.6%, while vans between 2.0-2.5 tonnes fell -2.8%. Year-to-date figures show heavy vans continue to dominate the market, with registrations up 10.8%. Mike Hawes, chief executive of the SMMT, said: “After a record performance in the first half of the year, it was inevitable that growth would start to level off over the summer. 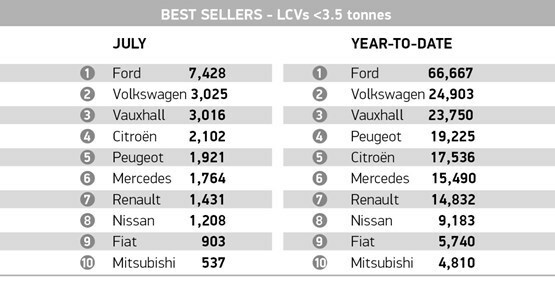 The top 10 best sellers show a telling picture of the market share between each manufacturer as the July top 10 almost replicates the top selling brands year-to-date, with only Citroen and Peugeot swapping places.